So, I haven’t blogged in quite a while, but recent events with Cliven Bundy have prompted me to write a sequel to my last post on the structure of racism. 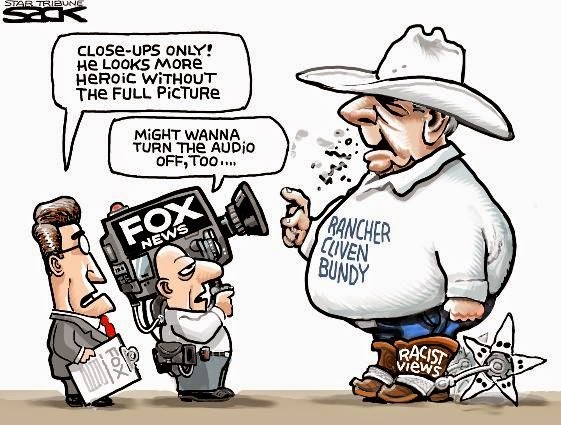 So now for the kicker, Bundy most likely does not view his statement as racist. He is probably confused and bewildered by the very accusation. And at the root of that confusion is “Gone with the Wind,” and the re-imagining of the myth of the Antebellum South. Despite popular belief, the South actually won the Civil War. Oh, they lost the battle, and lost it decisively. However, the Civil War didn’t end with Appomattox. It didn’t actually end until Margaret Mitchell won the war, completely and decisively. “How?” you might ask. Easy, she completely recast the story of the Civil War. She painted a picture of a noble and oppressed South, devastated by the tyrannical forces of Lincoln. She depicted happy, contented slaves, who needed their wise masters to teach them how to live. Most importantly, although subtly, she recast the war in terms of State’s Rights instead of being about slavery. These three depictions turned public opinion toward the South being the victim, not the aggressor in the conflict. No longer was the story that the South was willing to tear the Union apart simply to keep owning other humans, instead, it was a noble fight for local government taking precedence over an overreaching and monstrous Federalism. One hundred and forty nine years after the formal peace accord, the Southern Myth of the tyranny of “Big Government” is now the prime paradigm in the land. For all intents and purposes, the Federal Government is paralyzed and neutered. They are so frightened they can’t actually enforce a just and valid law requiring nominal grazing fees for running cattle on public lands. And, believe me, it was fear that stopped the removal of the cattle; had they proceeded, it would likely have sparked an actual rebellion in Nevada. Probably not a revolution or civil war, but certainly a conflict on par with Shay’s Rebellion. Worse, that rebellion could have spread out of control and into other states and regions. It might have taken years to calm the turmoil in the country, sparked by a single act. Further, you can see the actuality of the victory in the fact that many Americans hate and fear the Government. They view the government through the Regan filter of “the scariest words in the English Language are ‘I’m from the Government, and I’m here to help.’” When you view Federalism and a strong central authority as the most dangerous thing in the world, the Union has ultimately lost the war. But to return to the original point, in addition to fully buying into the Mitchellian myth of the tyrannical Feds, Bundy has bought the story of the “happy slave” hook line and sinker. This is a common trope in the South, where people cannot wrap their brains around the abject horror of American Slavery, which was actually the MOST abominable version of slavery the world has ever seen. Period. The reason for that is, in American Slavery, not only did you own people, but you had the right to sell families apart from each other. You could sell a small child from his parents, a wife from her husband. In fact, actual marriage between slaves was a criminal offense. No where else in history was this ability to split families allowed. Further, it was punishable by death to teach a slave to read or write, or give them any education. Both teacher and pupil faced this punishment. But Cliven Bundy is a product of the myth. He is a person, like many others in America, who actually believes that the African American population was better off as slaves. Thanks to Margaret Mitchell, we think the slaves were well cared for, maybe as well as a pampered pet, or something like that. And as such, he probably genuinely believes that his statement shows compassion and caring for the Black population of Nevada and of the USA. Further, mix in the idea that federal assistance is akin to slavery, and you have a view that many Americans are still slaves; slaves to a nameless faceless bureaucracy intent on draining away all that is good and right in the world. Suddenly you have a picture that Bundy thinks the benevolent Plantation Owner who loved his slaves like a person loves their pets is a far better slavery than slavery to the evil that is the Federal Government. And by this token, he is, to his way of thinking, being compassionate and caring. He thinks that people were actually better off as literal property, as opposed to virtual possessions. And he isn’t the only one. Many politicians and even average Americans hold this view. And ultimately, this is the danger of nostalgic myth. Because we like to paint the world of the past in a coat of rosy happiness, we do not learn the actual lessons of the past. People, even educated people, in refusing to come to terms with our atrocities, and coloring history with a haze of nostalgia pop off and make claims like Bundy did. And when that takes full root in society, we repeat the sins of the past, and have to again suffer the punishment for those sins.